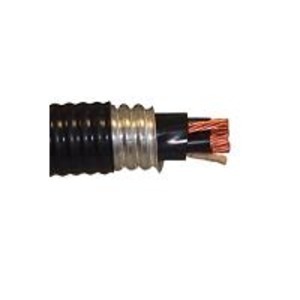 COPPER CONDUCTOR; 7 STRAND; 300VAC; ARMOURED INSTRUMENT CABLE INDIVIDUAL and OVERALL SHIELDED; CSA APPROVED; METER; GRAY; FT4; ARMOURED INSTRUMENT CABLE; 0.602 In. (15.300mm) O.D. ; MINUS 40 Deg. C Min. ; 75 Deg. C Max. ; #16 AWG; LONG LENGTH REEL; 2 TRIAD w/INDIVIDUAL and OVERALL ALUMINUM / POLYESTER TAPE SHIELD; TW75 PVC CONDUCTOR INSULATION; INTERLOCKED ALUMINUM ARMOUR w/SUNLIGHT RESISTANT FLAME RETARDANT LOW ACID GAS PVC JACKET; RoHS COMPLIANT; 174.000 Lbs./Mft.